Valerie Nye: You experienced a challenge eight years ago, to a large number of books when you were working at the public library. Can you describe the challenge? Kristin Pekoll: It was a six-month challenge that shoved me hard into the spotlight. The parent wanted over 80 LGBT books removed from the library. The truth is that claim about the 80 LGBT books was withdrawn, thus it was not the crux of the matter. 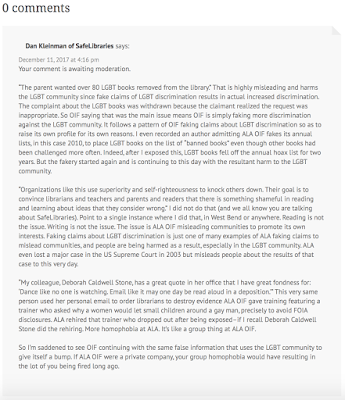 But ALA OIF is at it again with the false or misleading claims of discrimination, and resultant harm, against the LGBT community. "The parent wanted over 80 LGBT books removed from the library." That is highly misleading and harms the LGBT community since fake claims of LGBT discrimination results in actual increased discrimination. The complaint about the LGBT books was withdrawn because the claimant realized the request was inappropriate. So OIF saying that was the main issue means OIF is simply faking more discrimination against the LGBT community. It follows a pattern of OIF faking claims about LGBT discrimination so as to raise its own profile for its own reasons. 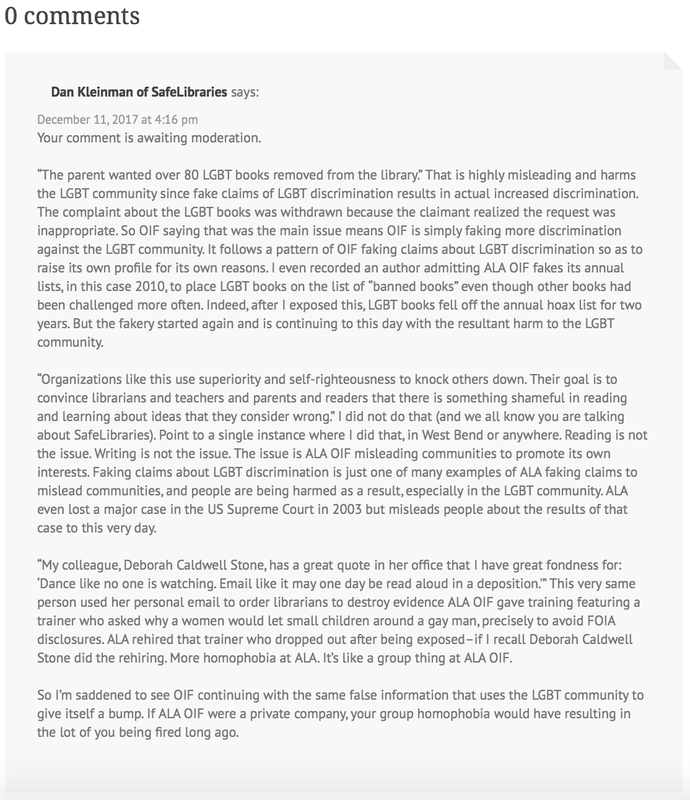 I even recorded an author admitting ALA OIF fakes its annual lists, in this case 2010, to place LGBT books on the list of "banned books" even though other books had been challenged more often. Indeed, after I exposed this, LGBT books fell off the annual hoax list for two years. But the fakery started again and is continuing to this day with the resultant harm to the LGBT community. "Organizations like this use superiority and self-righteousness to knock others down. Their goal is to convince librarians and teachers and parents and readers that there is something shameful in reading and learning about ideas that they consider wrong." I did not do that (and we all know you are talking about SafeLibraries). Point to a single instance where I did that, in West Bend or anywhere. Reading is not the issue. Writing is not the issue. The issue is ALA OIF misleading communities to promote its own interests. Faking claims about LGBT discrimination is just one of many examples of ALA faking claims to mislead communities, and people are being harmed as a result, especially in the LGBT community. ALA even lost a major case in the US Supreme Court in 2003 but misleads people about the results of that case to this very day. "My colleague, Deborah Caldwell Stone, has a great quote in her office that I have great fondness for: 'Dance like no one is watching. Email like it may one day be read aloud in a deposition.'" This very same person used her personal email to order librarians to destroy evidence ALA OIF gave training featuring a trainer who asked why a women would let small children around a gay man, precisely to avoid FOIA disclosures. ALA rehired that trainer who dropped out after being exposed--if I recall Deborah Caldwell Stone did the rehiring. More homophobia at ALA. It's like a group thing at ALA OIF. So I'm saddened to see OIF continuing with the same false information that uses the LGBT community to give itself a bump. If ALA OIF were a private company, your group homophobia would have result[ed] in the lot of you being fired long ago. There's so much more I could say about how ALA OIF's homophobia makes me angry because of the harm it likely causes. 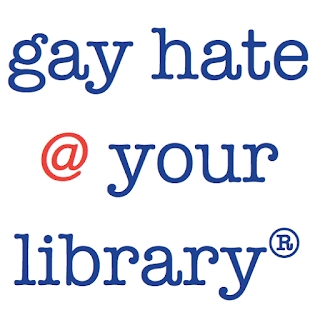 But I might get sued again with another settlement offer that I delete this current reporting, like when I wrote Gay Hate @ Your Library. It's still up, go read what ALA wanted censored, and it's staying up. Librarians, this homophobia is never going to stop so long as ALA OIF continues on unabated, without even a single challenge, without even a single peep. Gay Hate @ Your Library.